« ” I Like For You To Be Still” by Pablo Neruda. brayhan2 The short story that I read is called Krik? Krak? 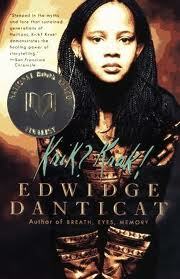 by Edwidge Danticat. The chapter that I read is called “Nineteen Thirty-Seven” it takes place in Haiti, where the years of thousands of Haitians where massacred by the Dominican soldiers. This particular chapter is about a young women(Josephine) finally understanding her family ancestor especially, her mothers death(Manman). This particular book and chapter is all about Haitian women trying to understand their relationships to their families. Finally why I chosen this book nor chapter is because it is full of tragedy stories, descriptive narrative-story and dramatic story-plot. Part of it is also, the diversity of suffering that demonstrates that everyone experiences in his or her own way. This entry was posted on Thursday, July 22nd, 2010 at 3:30 pm	and is filed under Uncategorized. You can follow any responses to this entry through the RSS 2.0 feed. Both comments and pings are currently closed. The article is very good, it reflects the problem, is worth pondering.